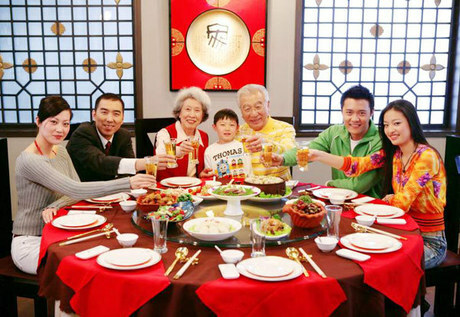 In China, the New Year is a time of family get-togethers. Family members meet at one another's homes for visits and meals; most notably a feast on New Year's Eve’. Many early Chinese immigrants in the U.S. arrived without their families, and found a sense of community with other settlers from China instead. 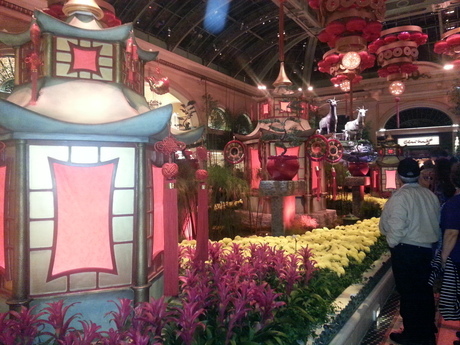 Today, many Chinese-American neighborhood associations host banquets and other New Year events. The Chinese New Year tradition is to reconcile, forget all grudges and sincerely wish peace and happiness for everyone. Those of us who do not have Asian heritage can still enjoy a celebration for family and friends. It’s really lots of fun, and we invite you to do the same. Invite family and friends for a celebratory dinner anytime between now and Feb. 19 when the Lantern Festival begins. Encourage every guest to dress in brightly colored attire. Clean your home thoroughly prior to your party, making sure to make your windows & mirrors spotless! Hang paper lanterns throughout your home. Purchase some fresh flowers to bring new Ch’i (energy) into your home. Surround yourself with fruit for a fruitful new year. 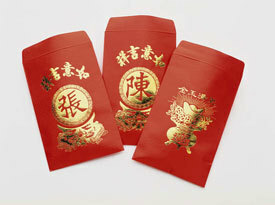 Place money in red envelopes if you have children and give them these envelopes for a lucky new year. Serve plenty of good food, including many different dishes. If I'm pressed for time, I sometimes have Chinese take-out for this meal! Have enough for leftovers, as this will bring good luck for the whole year. 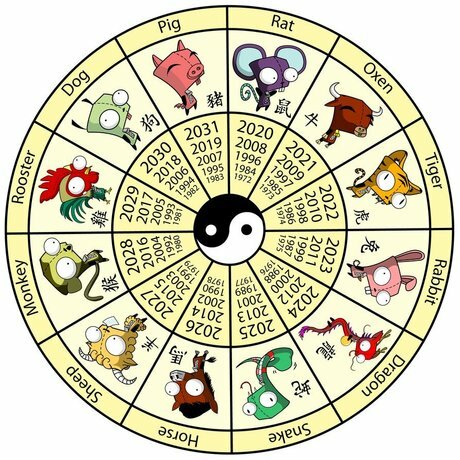 The months of the Chinese calendar are calculated by the lunar calendar, with each month beginning on the darkest day. New Year festivities traditionally start on New Year’s Eve’ or Lunar New Year and continue until the moon is brightest on the fifteenth day, the Lantern Festival. 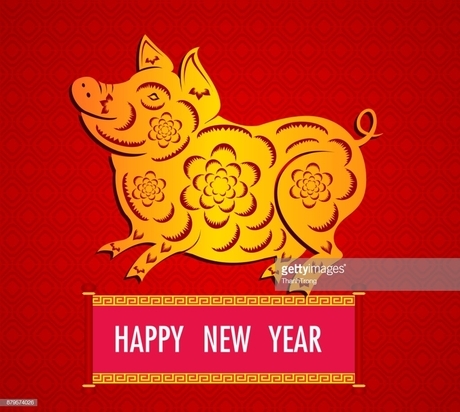 In ancient times, Buddha asked all the animals to meet him on Chinese New Year. Twelve came, and Buddha named a year after each one. He announced that the people born in each animal's year would have some of that animal's personality. Those born in Pig years are Hillary Clinton, Logan Paul, Luciano Pavarotti, Kareem Abdul-Jabbar, Dudley Moore, Julie Andrews, Carrie Underwood, Jerry Lee Lewis, Tupac Shakur, Tenzin Gyatso, Nolan Ryan, Johnny Bench, Elton John, Mariah Carey, David Letterman, Idina Menzel, Shannen Doherty, John McEnroy, Lance Armstrong, Peter Boyle, Danielle Steel, Simon Cowell, Christina Applegate, Richard Dreyfuss, Michael Hutchence, Carlos Santana, Winona Ryder, Dove Cameron, and Jane Curtin. 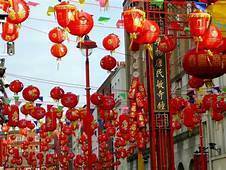 The lantern festival is held on the fifteenth day of the first lunar month, so this year it occurs on Feb. 19. Some lanterns displayed are amazing works of art, painted with zodiac signs, birds, flowers, animals, and scenes from legend and history. People hang glowing lanterns in temples, and carry lanterns to an evening parade under the light of the full moon. In many areas the highlight of the lantern festival is the dragon dance. The dragon, which is typically up to 100 ft. long is made of silk, paper, and bamboo and elevated on the arms of many dancers moving in a snake-like line. 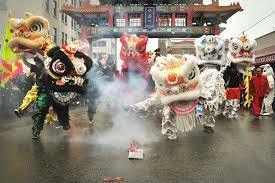 In the United States, where the New Year is celebrated with a shortened schedule, the dragon dance almost always takes place on a weekend. If you live in/near Seattle, check out the many activities available in the International District on the weekend.